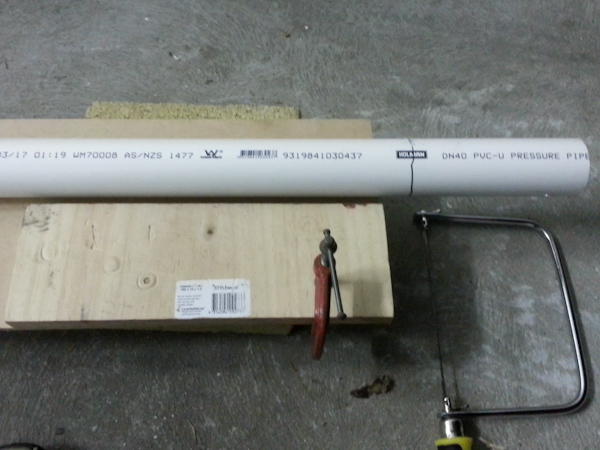 Thought I'd post up some details about my DIY inline PVC heater, very much like other builds out there. Apart from the Heyco 1" cord grip and the optional acrylic window, all the parts come from our friendly hardware store that shall not be named (but starts with a B and rhymes with Bunnings). This build is for an Eheim Jager 150W heating a 3 foot tank. I went with 40mm pipe to have a nice amount of water around the heater. The tubing my canister uses are 12/16, which fits over the 13mm tail with a bit of wrangling, but is absolutely watertight especially after tightening the hose clamps. The reducing bush and connecting socket were cemented to the elbow and tee joints. I probably should have applied a PVC primer before applying the cement, but I was impatient and haven't heard of too many problems if you don't. Apart from that minor indiscretion, I followed the instructions on the label, they're pretty easy. The cement has really strong fumes, so be sure to do this with lots of ventilation, and to wear gloves! I then loosely fitted the cord grip for demonstration. The pipe was measured for cutting such that the end of the heater wouldn't pass the end of the pipe. Be sure to take into account the amount of pipe going into the connectors, and that the cement is a lubricant that helps the parts slide all the way in. I marked a dodgy line and made an even dodgier cut. It doesn't matter too much as long as it's roughly straight. 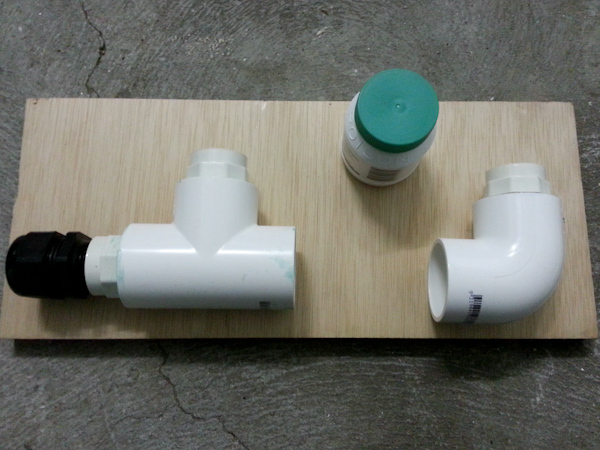 The edges were sanded to remove burrs, and the joining surface lightly sanded to remove the outer coating of the pipe. Then the two pieces were then cemented to the pipe. The tails fit nicely into the sockets, as does the cord grip. 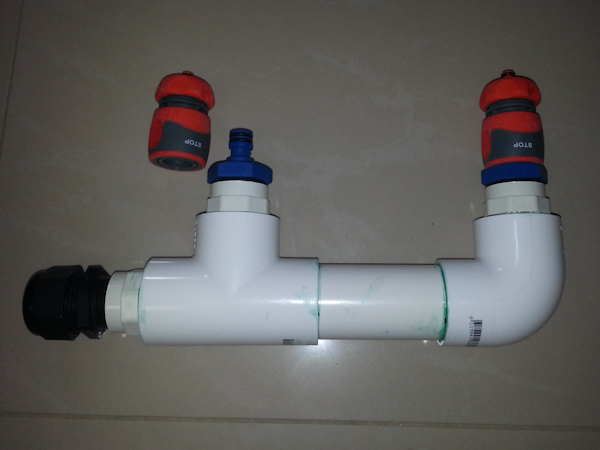 Plumbing tape is required to ensure a water tight seal. While researching for this build, I saw Grub's post about a clear acrylic window so that you can see if the heater is running or not. I luckily found clear acrylic rods for sale at a local art supply shop. Buying a whole 1 metre of the stuff just to use less than 10mm of it, crazy! The rod was cut, the ends sanded with fine grit paper, and lastly polished with Brasso to make it as clear as possible. A 4.5mm hole was drilled into the side of the cord grip where the heater light is. I should have drilled a 4mm hole, as it meant the acrylic rod was a tiny bit loose rather than being a tight friction fit. This was fixed by gluing the rod in with superglue. At the last minute I thought I might try garden hose stop connectors. In theory it would be easier to disconnect the inline heater during maintenance of my canister filter and CO2 reactor. Unfortunately, these connectors leak even after applying plumbing tape. To finish, the sockets were masked, the surface lightly sanded, and the body sprayed black with some automotive touch-up paint I had lying around. I waited a few days for the cement to cure and the fumes to go away. Before installation, I rinsed the unit out thoroughly with tap water. 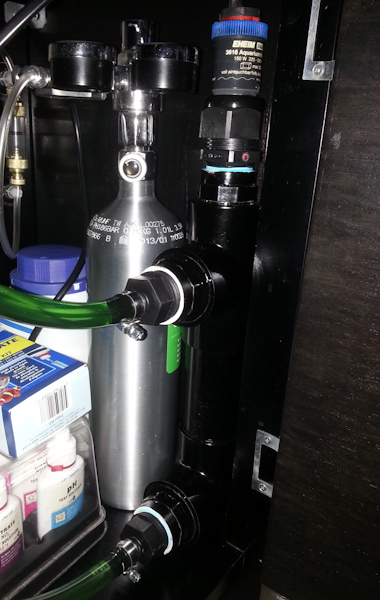 The water flows into the top hose from the canister filter, then down and out the bottom hose to the CO2 reactor. It took a day or so to dial in a thermostat setting I was happy with. The main issue is that there is some heat loss in the journey from the tank, via the canister, to the heater. 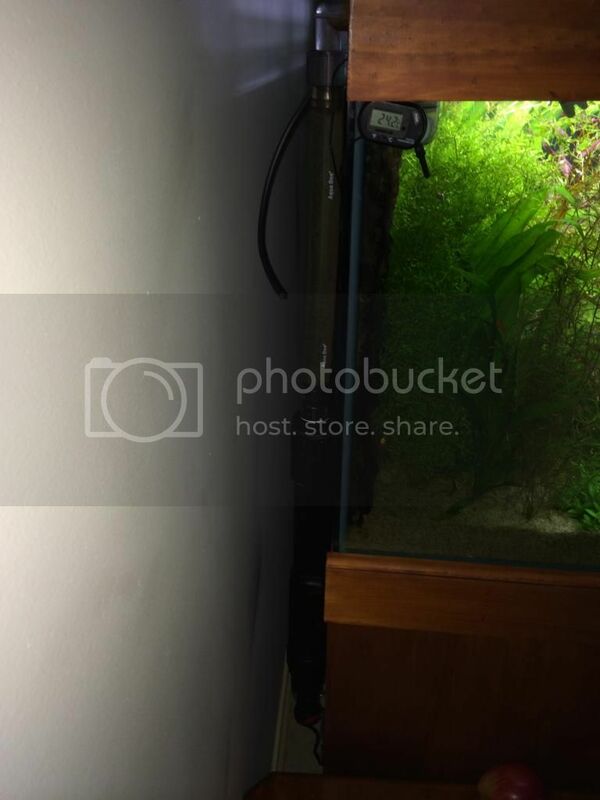 Also, the water returned to the tank loses a bit of heat. It means the heater thinks the water is cooler than it really is in the tank, and has to work harder to heat it. I'm running the water temperature at 24-25C to avoid the heater running too long, the heater is set to 22C, and it's winter here in Sydney (brrrr). Hope you guys found this information helpful! This was a fun build and took a few days when factoring curing times, but most of the assembly can be done in an afternoon. Last edited by Haitchpeasauce; 12-07-14 at 12:41 AM. Nice build. Did you order a free sample of the heyco or bought? If latter, I could have saved you some money by sourcing the beyco bere and sbipping it to you with the inclusion of a 2cm piece of clear acrylic for $10 or at least posted you a piece of acrylic only for $2. Also, I think it is best if you have water enter from bottom and leave from the top so that there is always water in the chamber. I have hardly any issues with heat loss as the heater is on occassionally and we have been getring some very cold nights like 1 degrees here. I also think you should swap the white plumbing tape for the pink premium one. Great post. Thanks for the info. I'm going to build one when I can get the parts together. Always fancied an inline to clean up my tank. doing this now, just waiting on my glands to rock up in the mail... will show mine when done too! Great build HP. I love to see people taking the time to paint the gear that sits in the cupboard out of sight Attention to detail! I think it is best if you have water enter from bottom and leave from the top so that there is always water in the chamber. Given the filter flow rate relative to chamber volume I suspect its likely to be irrelevant which way the water flows. That said I always set up top-in flow for two reasons. 1) Top-in flow should create more turbulence to disperse any air that gets trapped below the cord grip. 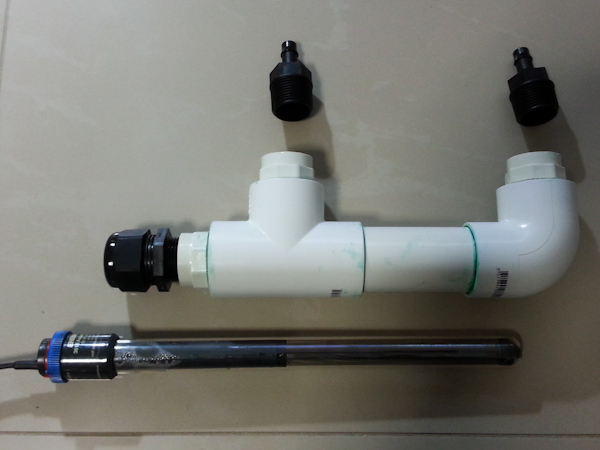 It will be less important for a narrow chamber such as this using 40mm pipe. 2) Most heaters have the thermostat located in the top so top-in flow directs tank water at the thermostat. Bottom-in flow has potential to cycle the heater more as warm water off the heater body could prematurely trigger the thermostat to cut off. Does it matter?... probably not! 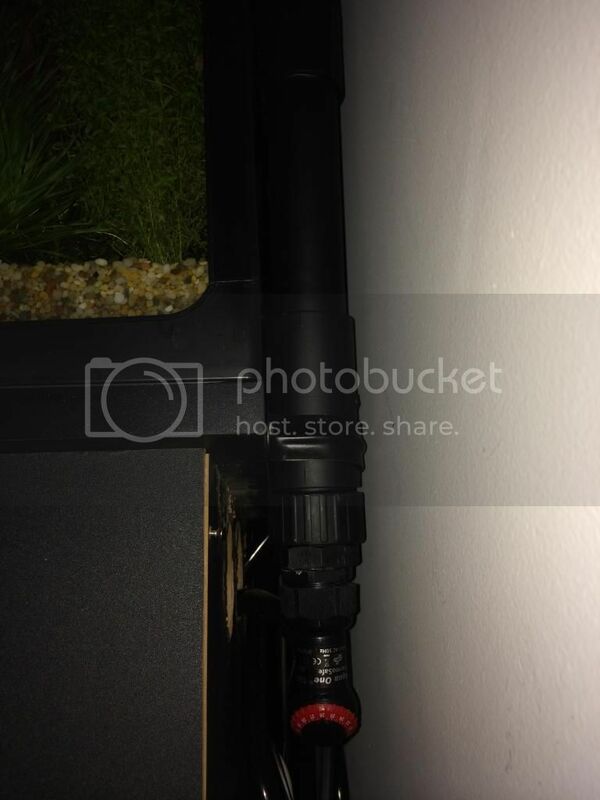 I chose the top as the inlet so that the tank water is hitting the thermostat. Bubbles aren't an issue, to purge just lift the unit and tilt it. I was using quality blue nylon tape. The white you see is PVC from the 25mm socket, which was masked off from the paint because I didn't want any getting into the thread or the chamber. And my other tank showing the exit side. I'll add that an air purge is only ever necessary after canister filter maintenance. At other times, any air bubble will dissolve in a short while. My inline heater build has had a marginal impact on flow, not really noticeable. Adding a bag of Macropore had a bigger effect on flow, and so do dirty tubes. 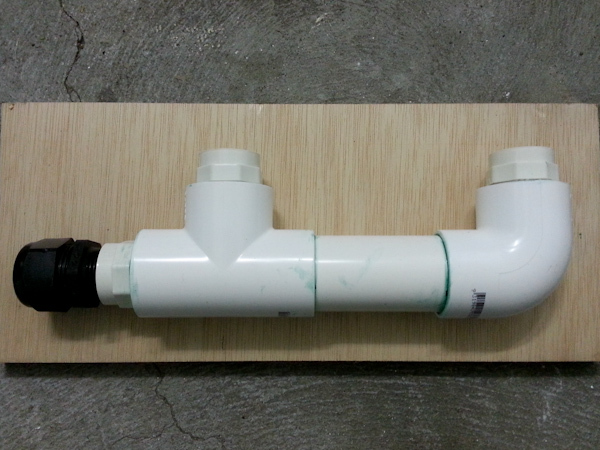 Im building one of these at the moment using the same size heater however using 32mm pipe . Im having difficulty getting my hands on a cable gland/ cord grip. I have tried middys which is an electrical supplies chain here in Melbourne with no luck. Can anyone suggest a place I can get one. You should be getting the Heyco 1 inch cord grip, which as a 25mm thread. 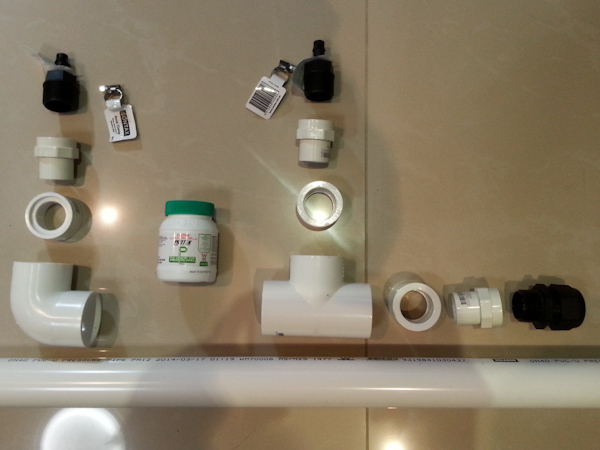 You'll need to find a 25mm threaded socket and, if necessary, the appropriate reducing bush to fit your pipe. i have everything aside from the heyco its all glued together just waiting for that one fitting. Gotcha. Mine I got when emboli ordered his from the US Heyco website. I checked the website last night because I need another one, looks like the free samples are over. I had a look at http://www.npa.com.au/heyco.html (based in Adelaide) but they don't have the threaded cord grip. Last edited by Haitchpeasauce; 25-07-14 at 03:36 PM.